Apparently, our world is not meant to end on Mayan Apocalypse of 21.12.2012, just yet. Instead, today might be the end to the hyper-extended Wave C(3) on our FKLI. This afternoon, news out of Washington that the GOP has shunned the vote on the tax bill, dubbed Plan B, proposed by Rep, Boehner. The fact that The House will only adjourned after Christmas sent world indices down sharply, realizing that there's only few days left for a deal to materialize in order to avoid the Cliff-fall. On FKLI, price retreats today following regional decline. We closed at 1,665 this week, forming a Tweezers Top (2-candle formation), signalling resistance at 1,674.5 level. Notice that price close in vicinity of the trendline supporting the magnificent run from 1,595 low (Dec 04) to the day's high of 1,674.5. 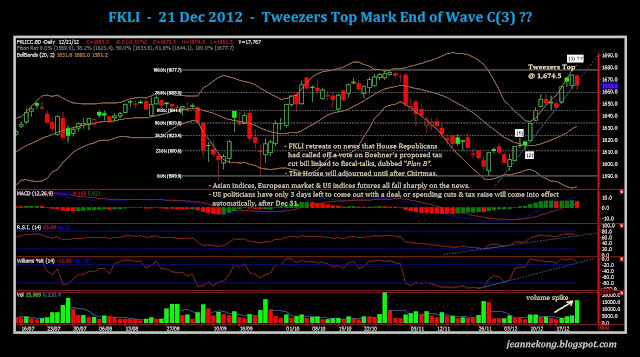 A decisive break below the trendline shall confirm the end of the current extended Wave C(3). An important point to note is the sudden spike in volume today, to 3x its 5d-average. Volume spike signals that a trend is near its end, which usually is followed by a trend change. If Short, I'll suggest shorting the Jan'13 contract, to avoid any funny spike on Dec 31 for a 'nice-looking' year's close on KLCI. Here, I'd like to highlight a crucial info on Malaysian government conduct. Few days ago, there's an article on The Edge Financial Daily, discussing on Malaysia's emergence as world's Top 3 for illicit capital outflow, just behind China & Mexico. 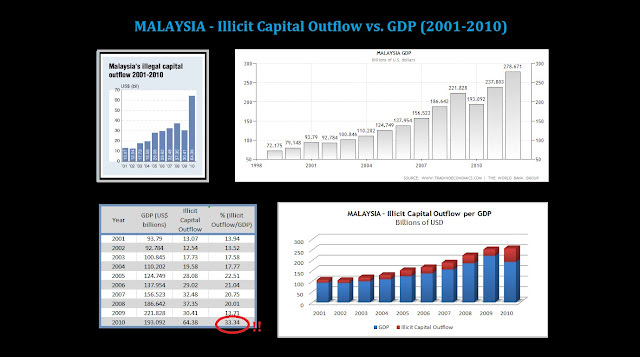 I went on some readings & did a chart on the amount of illicit capital outflow per Malaysia GDP value. The 2011 capital outflow estimated by GFI represents a whopping 1/3 of Malaysia GDP for that year. Imagine, had our government has implement measures to curb the illegal siphoning of capital out of our country, we might well have put an end to our consecutive 14-years of national budget deficit years ago. The loose regulations & deliberate ignorance on the matter's seriousness, coupled with Malaysia's infamous corrupted business environment, is more than enough as a wake-up call for Malaysian citizens. What I can say is we should vote wisely as informed citizens in the coming GE13. How Much Is Your Degree Worth ? ?